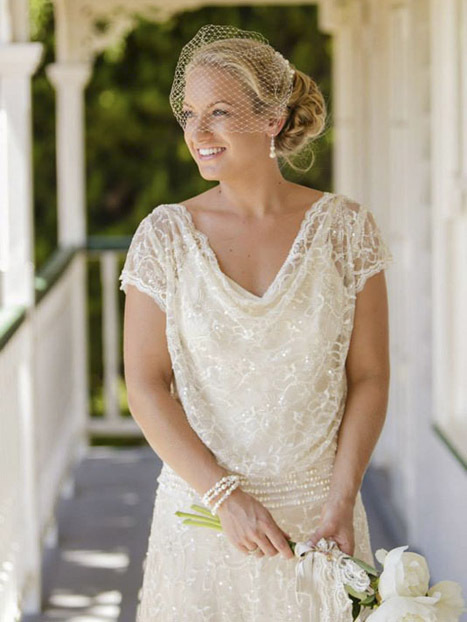 The Bridal House by Corina Snow, designs vintage gowns that reminisce the classic style and elegance of the past. These gowns emphasis a women's shape and femininity using quality luxurious silk fabrics. Corina's vast experience in design, coupled with your individual ideas, pictures, and inspirations, guides her to create a gown that not only suits your physical attributes but also complements the overall design and theme of your wedding. Corina is not just restricted to weddings based here in the beautiful Bay of Plenty or New Zealand as a whole. On the contrary over the past few years Corina's horizons have broadened, designing for clients who have married overseas including Canada, Ireland, England, Pacific Islands, Australia, Japan and Switzerland. "The skills and knowledge earned over that period allows me to create a gown that not only suits your physical attributes but uses the chosen fabric to compliment the overall design." Corina's vast experience in design, coupled with the clients' unique ideas, inspirations and the theme of the wedding, has allowed Corina to create the perfect look for countless brides.